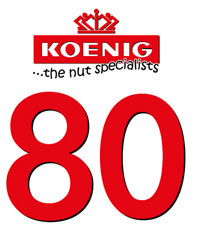 In May 2017 the company Koenig Backmittel Co. KG celebrated its 80th anniversary. In the third generation it is still a family-owned company and a very strong partner for the international food industry and the European Trade. Its strengths are based on decades of experience in professional competence, flexibility and an extremely high reliability in service and advice. Our positive development is characterized by its innovative design, advanced technology and lived motivation in the workforce and the management. We are delighted to look forward to a further successful cooperation with you.